and i almost gave up. tried to make one with a crochet pattern a few years ago, just the leg area was huge and didn't look nothing like a sock to me. but tried again recently by knitting a sock. at first gave up at the gusset area or more like just did my own thing because pattern got confusing. umm, that didn't work out. so then I slowly followed the pattern and was too happy when done. not to mention too easy! i may never buy store bought socks again. they are so warm and comfortable. feel as if made just for my foot. 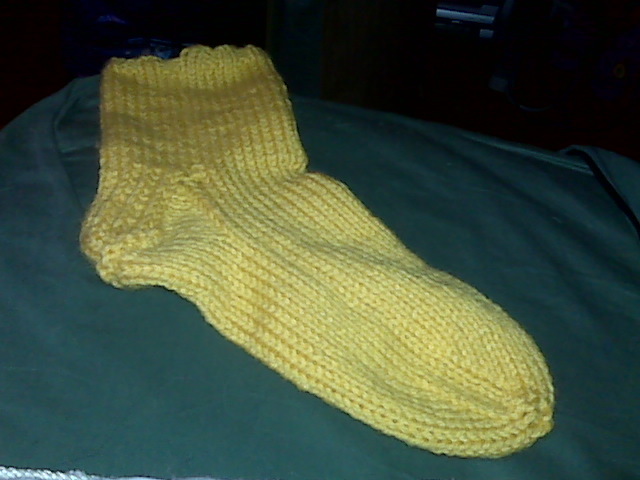 so then I made another yellow one, but with different colors - cool unmatching socks! i can start a trend. so had to make a pair for my sweetie.